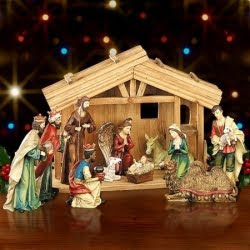 I love looking at Nativity scenes. Mary and Joseph proudly looking over their Son, who is in swaddling clothes and nestled comfortably in a manger. Wise men on one knee, presenting gifts to the new King. Shepherds looking on in adoration, with a sheep or camel nearby. Maybe even a single light bulb casting a soft glow over the entire set. Those scenes are always so peaceful, but they betray the challenges that must have led up to that perfect moment. Take the journey, for example. Bethlehem is about 90 miles from Nazareth. That journey must have taken over 5 days given the trail and Mary's advanced pregnancy. I've never been 8+ months pregnant or on a donkey in the desert, but I have a hunch the combination is probably extremely uncomfortable. I'm sure it was also littered with bandits, treacherous hazards, and extreme temperatures. Or what about the delivery itself? In a stable? On hay? With animals around? And no drugs? Let's not forget eight or nine months before all that, Mary had to find the courage to tell her parents and future husband that She was pregnant. Can you imagine how that conversation went, especially after She told them the Father was God? Not only was that probably a terrifying conversation, but one that could have led to her death! And in between, I'm sure both Mary and Joseph had to overcome serious doubts, fears and concerns. What would the Son of God look like? Was He going to come out speaking? Glowing? Was it all really happening to them? How would they know what to say to Him? Would they be able to teach Him anything at all? Would He lead Israel in some kind of war? Would He be able to fly or walk on water? I always take for granted that I know what happened thanks to Evangelists like Luke - but Mary and Joseph were running on 100% faith. That's why every time I see a Nativity scene, I not only reflect on the birth of our Savior, but on the incredible sacrifices Mary and Joseph made, and the inspiring faith they had. I hope you are having a blessed Advent. P.S. I almost signed off without reminding you that Mary and Joseph went through all of that at the tender age of 16ish. P.P.S. Stay tuned for follow up posts entitled "How to escape to Egypt when a king wants to kill your baby" and "Traveling through the desert with a Newborn"
Great post! Joseph's humility always amazes me. Thank you for this beautiful reminder that this holy family sacrificed and endured much before that peaceful Christmas moment. I just finished a book called St. Joseph, which was really enlightening as to the conditions the Holy Family endured, and gave a lot of insight into the kind of man St. Joseph was. I'll check on who the author was and let you know. Karinann - thanks for the comment! What Joseph and Mary did never ceases to amaze me. Shirley - yes please let me know the info- I would love to read that book! The story of Jesus' birth is incredible in almost every detail - and it is easy for me to look at the common symbols and think nothing about it. You are so right Michael. The things Joseph and Mary had to endure was incredible. Thank you for this reminder. Sometimes I get so wrapped up in the joy that I forget about the hardships. This was a great post as usual.